Brother Richard Hartline is our pastor. 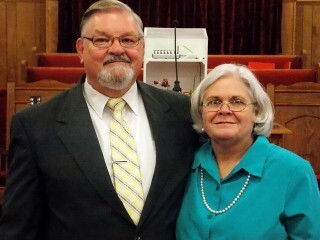 He and his wife Sandra have been at the church since 1990. They recently celebrated 26 years of pastoring this great church. In a day of instability you will find something solid in the Bible teaching ministry of Godfrey Avenue Baptist Church. We are an old-fashioned Independent Baptist Church standing for the old-time faith built upon the Inspired Word of God which is preserved in the King James Bible. We desire to fulfill our Lord's command in Matthew 28:19-20 by winning the lost to Jesus, baptizing them, and teaching them how to live a victorious life in Christ. We strive to reach this goal through personal witnessing, preaching, teaching, and world missions. Salvation as a free gift of God’s grace, received through personal faith in Christ. Separation and holy living as God’s will for Christians. Sunday School: ..................................... 10:00 a.m.
Sunday Morning Worship: ....................... 11:00 a.m.
Master Clubs: .......................... Sunday at 5:00 p.m.
Sunday Evening Worship: ......................... 6:30 p.m. Prayer Meeting & Bible Study: .. Wednesday 6:30 p.m.
Sunday Radio on WZOB: .......................... 9:30 a.m.
A nursery is available for all services.